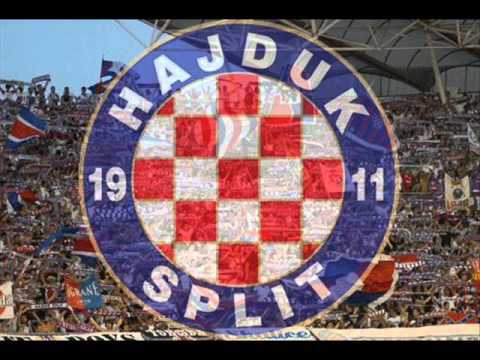 N.K.Hajduk Split was founded by a group of students (Fabijan Kaliterna, Lucijan Stella, Ivan Sakic and Vjekoslav Ivanisevic) who studied in Prague, where they watched matches played by Sparta and Slavija. They came across the idea to establish a football club in their home town. Young people of Split very soon accepted football as the major sport, above all others. The organization was very feeble at the beginning. One afternoon, at the Troccoli caffe, on the central square in Split, the first rules of the football club were written. Everything turned out to be rather simple, except the name of the club. Finally, professor Barac suggested the name Hajduk, which was well accepted. Working and rules permit were applied for from the government, and finally, on February 13, 1911, the rules of the football club were accepted and the working permit granted by the Royal authorities. After that, almost everybody started to participate in constructing a football ground on the location called Kraljeva njiva (King's Field), which had been used as a military training ground of the Austrian-Hungarian army. Fabijan Kaliterna sent the first outfits from Prague. After the first few training matches between the first and the second team, the time came for the first official match to be held. The opponent was Calcio, the team of local italians. The match ended with score 9:0 (6:0) for Hajduk. The first goal in the club history was scored by Sime Raunig with his knee. In 1913, Hajduk played its first guest match, in Zagreb, against HASK, and lost 2:3. A number of matches that Hajduk played in those times were aimed not only at increasing the team strength, but also at increasing the club's financial stability. In 1923. Hajduk played, for the first time, in the league of the Kingdom of Yugoslavia, but did not achieve much. In the organization of the city authorities, Hajduk toured North Africa, where the team scored its first great results and won international reputation. On this tour, Hajduk won its first international match (Hajduk-Marseille 3:2). No other event could have drawn the attention of the citizens of Split such as the great success of their club, so the entire city gathered at the port to cheer the Hajduk players on their return home. The matches of Hajduk and all issues relating the club made the major topic of conversation of all citizens at every city corner. In the year 1924, the entire team of Hajduk (except the goalkeeper who was Italian) played for the national team, thanks to their great results achieved both on domestic and international fields. Hajduk became the inspiration to many artists, especially musicians. The most famous was Ivo Tijardovic , who wrote the operetta under the title Kraljica baluna (The Queen of Football), in the honor of the 15th anniversary of the club. In 1927, Hajduk won its first championship title; in 1929 its second. In 1931, Hajduk toured the United States to celebrate its 20th anniversary. In 1941, the club won the Croatian Championship. During World War II, the players of Hajduk played for the Yugoslav Army team against allied teams. After World War II, Hajduk continued to play in the Yugoslav championship and cup. In 1946, Hajduk won the Championship of Croatia and started the magazine Hajdukov vjesnik (The Hajduk Herald). In 1948-49 Hajduk toured Australia and was the first Yugoslav club which played on all continents. In 1950, Hajduk won the Yugoslav Championship without a single lost game. No club has ever managed to achieve such a score. That same year Torcida was founded - the organization of Hajduk supporters (named after Brazilian fans). In 1951 the club reconstructed the stadium Stari plac. Hajduk won its 6th champion title in 1952. Between 1954 and 1966 Hajduk did not achieve significant results in the championship, and it played three cup finals, but won none of them. In the season of 1966-67 Hajduk finally won the Yugoslav Cup and added it to the club's trophy collection. This was the first season that Hajduk played for one of the UEFA competitions. 1970 until 1980 was the period of the Golden Generation of Hajduk players. This generation achieved the greatest results in the club history. Four champion titles were won and five cups successively from 1972 to 1977 (which no other club in the former Yugoslavia has ever managed). In that period Hajduk played in European cups successfully. The greatest success was achieved in 1972-73 when Hajduk got to semi-finals in the Cup Winners Cup. In the year of 1979, Hajduk moved to the new stadium in Poljud. Between 1980 and 1991 Hajduk won 3 more national cups (1984,1987 and 1991). Hajduk repeated its greatest European success and once again played semi-finals of the UEFA cup in the season of 1983-84. Hajduk won its first national championship title on the Poljud Stadium in 1992. This title is a very significant for the club, because it was the first National Championship of the Republic of Croatia. In 1992-93 Hajduk won the Croatian Cup, and in 1993-94 the champion title. As the national champion or cup winner, Hajduk played for the Supercup title and won all of them (1992,1993,1994). In the season of 1994-95, Hajduk won both the National Championship and Cup. (Thus, automatically the Supercup). Dado PRŠO, Vlatko ĐOLONGA, Marin KOVAČIĆ, Nikica CUKROV, Saša PERŠON, Mario BOLJAT, Nenad ŠALOV, Branko KARAČIĆ, Miloš BURSAĆ, Boriša ĐORĐEVIĆ, Zoran VARVODIĆ, Vinko PODUJE, Branko MILJUŠ, Ivan PUDAR, Bartul ČULIĆ, Tomislav ERCEG, Stipe PLETIKOSA, Darko DRAŽIĆ, Aleksandar RISTIĆ, Nenad GRAČAN, Ante SIRKOVIĆ, Gajo RAFANELLI, Zoran SIMOVIĆ, Džemaludin MUŠOVIĆ, Mario CAREVIĆ, Pave GAROV, Ante VULIĆ, Mass SARR, Sergije KREŠIĆ, Davor ČOP, Miroslav FERIĆ, Hrvoje VEJIĆ, Nikola RADOVIĆ, Šime PODUJE, Mirko BONAČIĆ, Ervin KATNIĆ, Ivica MATKOVIĆ, Stane KRSTULOVIĆ, Josip WEBER, Goran SABLIĆ, Joško JELIČIĆ, Šime RAUNIG, Mato NERETLJAK, Lenko GRČIĆ, Ive JEROLIMOV, Dušan PEŠIĆ, Ante "Biće" MLADINIĆ, Ivan LEKO, Boris ŽIVKOVIĆ, Dragi SETINOV, Šime LUKETIN, Stjepan DEVERIĆ, Niko ČEKO, Zvonimir DERANJA, Goran VUČEVIĆ, Nenad PRALIJA, Sulejman REBAC, Ante MIŠE, Nikola GAZDIĆ, Branko KRALJEVIĆ, Ivo RADOVNIKOVIĆ, Nikola JERKAN, Jerko TIPURIĆ, Ardian KOZNIKU, Tonći GABRIĆ, Ivan PAVLICA, Mihovil BOROVIĆ, Vinko RADIĆ, Ante Tonči BONAČIĆ, Darijo SRNA, Darko MILADIN, Anthony ŠERIĆ, Xevat PREKAZI, Mišo KRSTIČEVIĆ, Dean RAČUNICA, Novak TOMIĆ, Igor MUSA, Luka KALITERNA, Ivica MORNAR, Otmar GAZZARI, Lujo KLEMEN, Miroslav BRKLJAČA, Jurica VUČKO, Rade TOŠIĆ, Anđelko MARUŠIĆ, Stjepan ILIĆ, Igor TUDOR, Zlatomir OBRADOV.